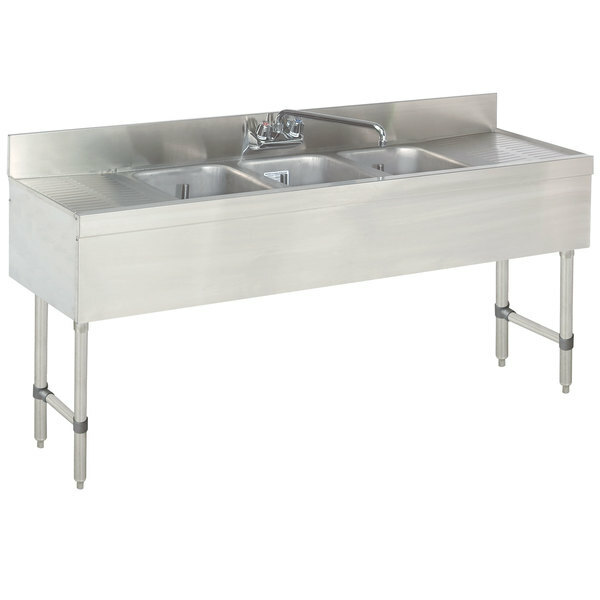 Advance Tabco SLB-73C Lite Three Compartment Stainless Steel Bar Sink with Two 24" Drainboards - 84" x 18"
Wash, rinse, sanitize, and more with this versatile Advance Tabco SLB-73C three compartment stainless steel bar sink. Each bowl boasts a fabricated, seamless design that measures 10" x 14" x 10". A 4" backsplash and pair of 24" embossed drainboards keep the nearby walls and floors dry, which reduces the potential for wet, slippery surfaces in a dishwashing area. Each faucet meets federal lead free standards, making this Advance Tabco SLB-73C bar sink the perfect addition to any commercial kitchen.